In this section, the student finds fifteen short MSA essays similar to a daily journal of a British architect who gets a contract in the UAE, and describes his new work and living environment. 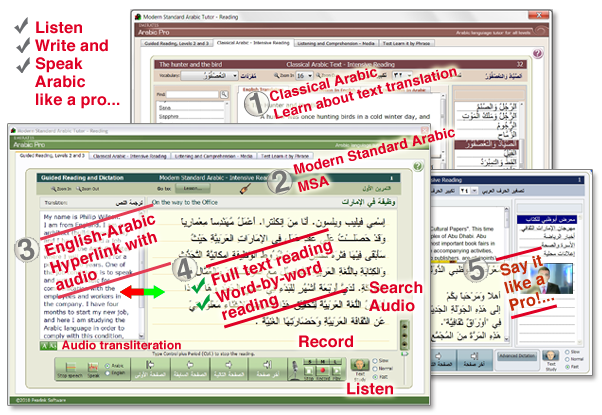 Listen to a 1- Full Arabic audio reading, 2- Arabic text reading with English Translation and transliteration, 3- Arabic Text Study and dictation, and 4- English translation text-to-speech reading. Dictation: Select the "Slow" button next to the Text Study button icon to start the dictation exercise. Zoom in and Zoom out icons are for preset font sizes. However, you also have the option to select font and size to ease reading. Use the Pull-down menu to go to a specific lesson number when needed. Study Rare Classical Arabic Essays for Higher Education. Read a short biography about the writer both in English and in Arabic, and learn about good translation. Get a list of selected audio clips from daily media sources (Radio and Television). The student can access more of that directly from our custom internet browser availabel in this version of the program. Just choose the Internet contextual menu button and use the search engine of your choice then select Arab Radio and Television.